Estadio Nuevo Los Cármenes has been the home stadium of Granada CF since it’s construction in 1995. The ground has been designed for multi-purpose but the majority of its usage is for football, with the recent renovation in 2011 reflecting this, giving the stadium a capacity of 23,156. Granada opened the stadium with an inaugural friendly match against Real Betis, with the homeside team triumphing 4-1 in the Nuevo Estadio Los Cármenes although Real Madrid faced Bayer Leverkusen in a friendly before this. Located in the same Zaidín-Orchards part of town but on a different piece of land near to Plaza de Toros de Granada, the old stadium was sold in order to service long standing debts. 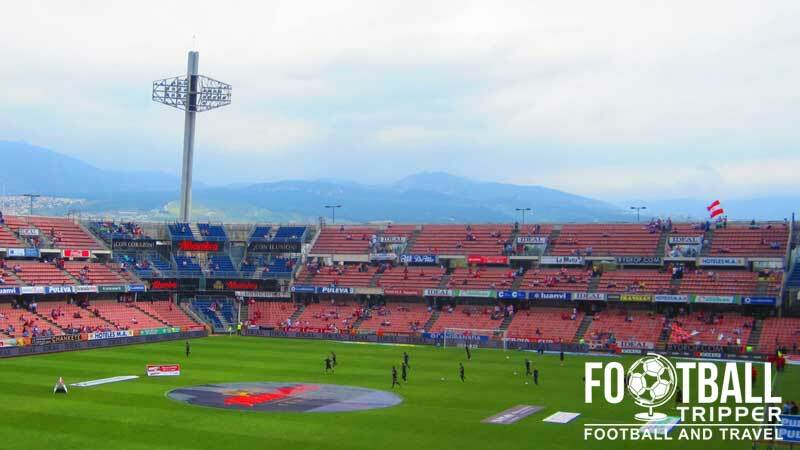 When El Graná achieved promotion to the top tier of Spanish Football in 2011, the empty space between stands was filled in to give the club corner seating which boosted the capacity from the initial 16,200 to a much larger 22,524 – an increase of over 25%. 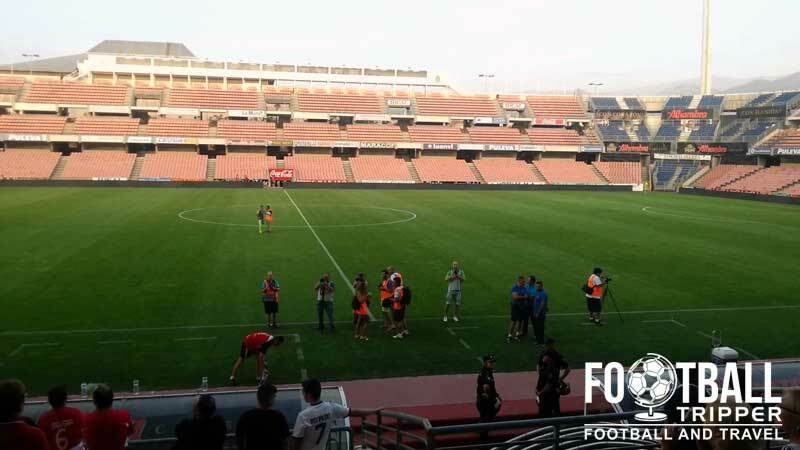 With the addition of 23 VIP Boxes which can entertain over 500 football fans, stadium Los Cármenes and sponsorship deal with the local Granada city council, the club have built a modern day stadium both fans and the country can be proud of. This sense of acute pride in the facilities was reflected in Los Cármenes hosting 4 matches and 4 victories of the national team: Russia (1-0), Bulgaria (1-0), Czech Republic (2-1) and a goal-fest against minnows Cyprus (6-0). With a continuation of the old stadium’s international pedigree, Nuevo Los Cármenes witnessed Xavi making his centenary (100th) appearance for the national team as well as David Villa breaking Raul’s goal scoring record, and even hosted Albania’s home games against Ukraine and Germany in 1997 following a period of civil war in the country. Los Cármenes consists of four sections: Fondo Norte, Preferencia (East), Fondo Sur and Tribuna (West). Away fans who make the trip Estadio Los Carmenes are usually housed within the north-east corner between fondo norte (Sector D) and Preferencia (Sector B). Views outside the stadium are superb, with the Sierra Nevada mountain range providing one of the most majestic backdrops for a football stadium in the world. There is lots of choice for pre and post-match drinking with the simply named Bar & Grill and The Cervecería ECU being two well-liked venues located along the Paseo del Emperador Carlos Vavenue which leads up to the stadium. Much nearer there is the Café Futbol Sur and Café Bar Estadio which are both frequented by local fans. Away from the stadium itself, you can’t go wrong with any of the places off of and around Plaza Campo del Príncipe, Plaza Nueva or the student friendly zone, Calle Pedro Antonio de Alarcón. The local beer is known as Alhambra, and besides the numerous Tapas dishes which are served throughout the city. Granada CF operate a remarkable four stores throughout the city in addition to their official online Tienda. with the main shop being located at Calle Recogidas 35. A glimpse inside the modern interior of the classy Granada Tienda. Refreshing to see such sparse arrangement of merchandise, sports direct take note. There doesn’t appear to be any publicly available stadium tours of Estadio Nuevo Los Cármenes but if this ever changes we’ll be sure to update this section. Tickets to see Granada CF can either be purchased online or in person at the Taquillas (Ticket windows) at the Nuevo Los Cármenes in the days leading up to the match. 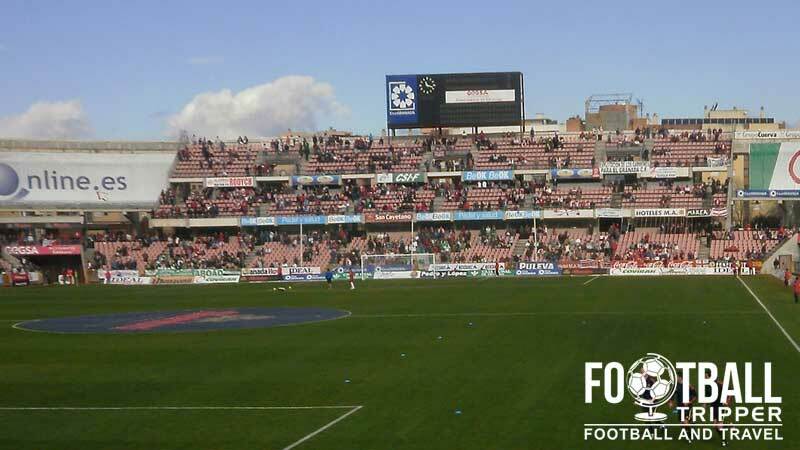 Granada holds the distinction of being one of the minority of Spanish clubs which sell out their home games regularly, so unlike other clubs you might not want to risk purchasing tickets on the day of the match. 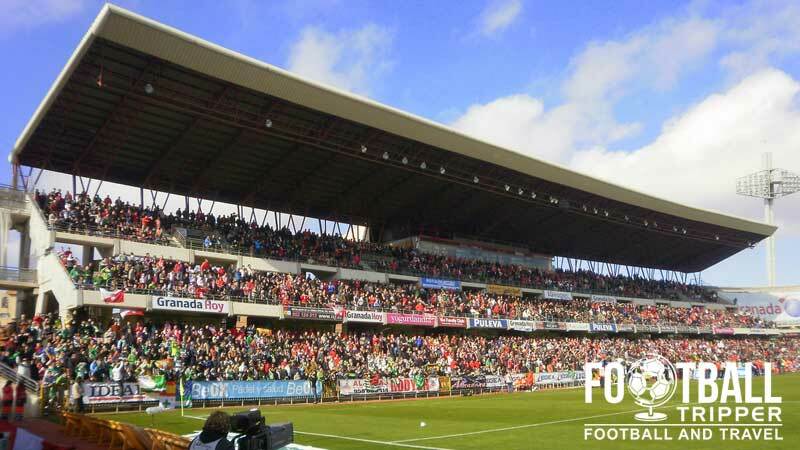 Usually the ticket office and stadium shop is open between 10.00 am- 2 .00 pm and 5.00 pm – 8.00pm in the days leading up to the match, and you can expect to pay around €30.00 for seats in the Fondo section C and D (Behind the goal), €35.00 for Esquinas (Corners) and at a starting price of €40 for Preferencia and €55.00 for Tribuna which is the main stand. 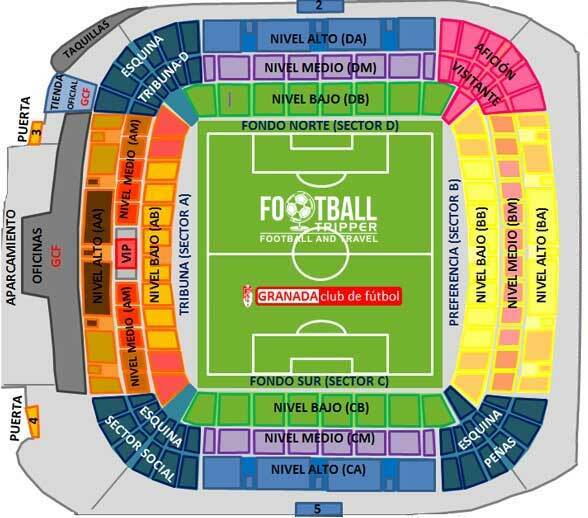 Note: Prices increase by around €20.00 for when the two giants of Spanish Football visit the stadium. Estadio Nuevo Los Cármenes can be found in the Southernmost part of Granada in the suburb of Zaidín, dotted between the A-395 and A-44 roads, approximately 4km from the historic city centre. One of the main gates leading to Granada’s Stadium. At a distance of around 4.4km from the city centre, the journey by foot will likely take you just under 1 hour. Regardless of whether you are heading from the North (A-44) or the South (E-902) Autovía de Sierra Nevada, you need to look for exit signs for the Alhambra (A-395). Once you have exited you can get onto the Ctra. Zubia Prla followed by a roundabout which requires you to take the 4th exit into Calle Torre de la Comares which is right outside the stadium. Check out Parkopedia for the a list of parking options and their prices. There is no official on-site parking at the stadium on matchdays. Granada railway station also known as the Andalusians station is the only train station within the city and is run by the ADIF Network. As it serves primarily intercity lines, there isn’t a suitable use for it in getting to the Estadio. In theory there is a Granada Metro (Metro de Granda in Spanish) but in reality it is still under construction. Initially planned to be built in 2008 at a cost of estimated €500 million euros, the project was delayed following the global financial crisis and a lack of liquidity with the completion date put back until 2014. When it is complete it will connect Granada to the town of Albolote, Maracena and Armilla with a total length of 15.9 kilometres giving parts of the stadium such as Estadio Los Carmenes greater visibility. Bus number 4 – You can catch it from either Avenida de la Constitución near the train station, or at the Calle Reyes Católicos in the historic centre amongst other stops. Heading in the direction of Torre de la Pólvora you will need to get off at the Pintor Maldonado stop which is in front of the stadium. Bus number 10 – Can be got from the Emperador Palacio de Deportes station which is 16 stops away, going through the Western and Northern areas of the city. The nearest airport is Federico García Lorca Granada-Jaén Airport which is 15km out of town to the West, with Malaga Airport being the closet international airport approximately 135km away. Once you have landed locally, you can get a 40 minute bus service to the city centre at a cost of €3.00 or a taxi which will cost around €24.00 – €30.00 depending on time of day. If you have arrived at Malaga airport you can catch a bus directly to the airport at a cost of just over €10.00, with a journey time of approximately 2 hours and 30 minutes. Rental cars FTW. The closest accommodation to Estadio Nuevo Los Carmenes is Hotel Abades Nevada Palace with there not being much choice besides this option if you’re looking for something nearby. If you’re looking for a bridge between the city centre and the football ground then the Hotel Andalucia Centre is a solid choice, and if you just want something completely central try the Hotel Granada Centro.